The world has been built from concrete, making it the most widely used building material, for centuries. 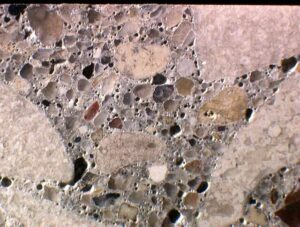 Even today, roman cement is being studied and researched because of its tremendous ability to withstand time. bonded together by a cement and water, but there’s a huge amount of chemistry involved in finding exactly the right combination of ingredients. The most common form of cement is known as Portland Cement. Limestone and clay are the leading raw materials utilized in the production of cement and quarrying of these has started to become the source of environmental degradation. Previous research has shown that in the coming years limestone will difficult to source for cement manufacturing. In addition, the production of a single ton of cement emits around one ton of carbon dioxide. To compound the problem of Portland Cement, the disposal of this product is expensive, toxic and is taking up valuable space in municipal landfills. All these issues combined with a carbon tax will make this product much more expensive. This article will explore several known solutions, trends and benefits. The term ‘precast’ means a product manufactured by casting concrete into reusable molds or forms inside a manufacturing plant off-site. This is in contrast to site-specific forms where the concrete must cure in place before other construction phases can proceed. For architectural ornaments, precast products can be created from custom “one off” as well as stock molds. 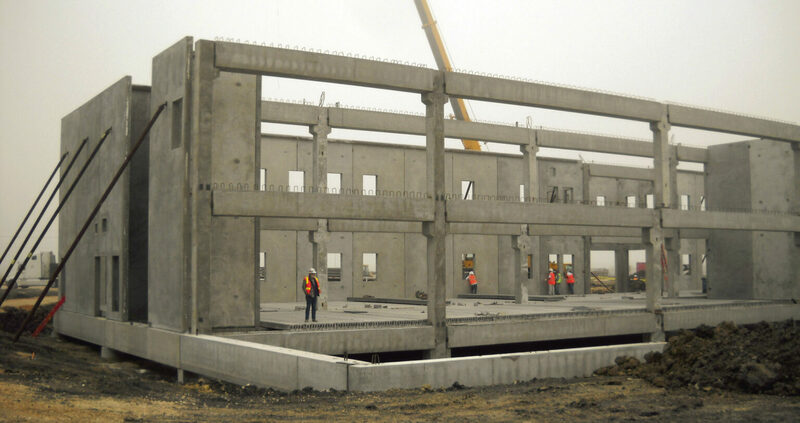 The benefit of precast concrete is that the manufacturing location is fixed, lending the process to automation. In the near future the majority of workers will be replaced by robots. It is estimated by a recent PWC report that 38% of all US workers will be replaced within 15 years or by 2032. The highest at risk jobs are in financial services at 61%. Trebuchet predicts, that with the introduction of automation and 3D printing the current “bar” of unskilled craftsmen will be eliminated and to stay competitive, developers will rely on more sophisticated and complicated designs to attract buyers and tenants. Vollert is a German company that has been on the forefront of precast factory automation, and in the coming years automation will become even more prevalent as initial factory equipment costs trend downward. Precast also dovetails with pre-fab structures, providing opportunities in student housing, low cost housing and barriers. This could even mean a return on more superfluous and pretty structures in the neo-classical or Beaux Arts style of architecture. Unlike Portland cement, geopolymer concrete that uses Pozzolans from Coal fly ash also called pulverized fuel ash or PFA. That coal ash is a by-product of burring coal for energy. The majority of this ash is landfilled because cement companies didn’t want the material. Toxic, short usable life Portland cement is popular because is cheap to produce, meets RFP lowest bidder municipal contacts and can be poured on site. Unsophisticated buyers place no objections to low quality Portland cement. And cement manufacturers work tirelessly to make the lowest possible quality product at the highest possible price the buyer is willing to pay. The Carbon tax burden and the lime shortage may be a game changer. Insider fact: The easier concrete is to pour, the weaker it will be when cured because of the excessive water content. What this means for building and architecture is we are entering in a new gilded age. Citizens in cities no longer have to put up with cookie cutter bland disposable architecture. Developers can use precast cement company’s technology and automation combined with 3D printing to make spectacularly detailed molds to form precast friezes and architectural elements such as, window sills, stair treads, lintels and copings and color it to look exactly like stone. And they can do it cheaper, faster, with better working conditions to make a product that is more durable, lasts longer in cold weather and is safer to demolish when that time comes. Investors in private equity real estate should insist that these funds build with these kinds of materials. As investors and developers, we want to build pretty buildings, and contribute architectural significance to cities we choose to invest in. By doing so, we believe this constitutes sustainability fund guidelines crafted by plan sponsors. Let’s bring back pretty together!